Why urban soil isn’t as healthy as it looks – and what you can do about it. In urban areas, our soil isn’t as healthy as it looks. Whereas once leaves would recycle and create nutrients for the topsoil, the natural cycles are now broken. Issues such as compaction and man-made materials can affect growing conditions and hold our trees and plants back from flourishing. The essential element of developing healthy gardens is right under our feet yet is often the most overlooked in our mission to ‘green’ our urban areas. When looking at improving our urban trees and gardens, we need to spend more time where it all starts: at ground level. Organic soil comprises layers of leaf and plant litter at the surface, a decomposition layer, and a lower layer containing ‘humus’. When the organic matter at the top incorporates with the surface soil it forms topsoil, which contains the optimum conditions for plant growth. Unlike dirt, organic soil (as seen in undisturbed forests and woodlands) contains a myriad of life forms. These tiny soil organisms break down, aerate and help nourish organic soil. They play a vital role in helping plant matter decompose, as well as mineralization: returning nutrients to their mineral forms, which plants take up again. Once all microbes have broken down all they can, what’s left at the end of the process is humus. This dark brown substance is made up of carbon, nitrogen, soil minerals and soil aggregates, and can remain unchanged in the soil for potentially millennia. Humus helps the soil retain moisture and encourages formation of soil structure. With all the properties of soil in balance – including moisture content, temperature, aeration, pH and nutrient content – we can create the necessary fertile foundation to support tree and plant life. Without these elements cycling properly, our soils become poor in quality. Different types of microbes are specialised to break down different types of organic matter. Between them, they can break down just about everything. What is wrong with urban soils? From private gardens to schools and development sites, urban soils are profoundly affected by human activity. A number of different factors in urban environments seriously affect the way our plants perform. In cities, the earth has typically been scraped and graded, often with a significant reduction or total loss of topsoil. Soil compaction by heavy machinery, vehicles and foot traffic is very common. Compacted soil suffers from restricted aeration and water drainage and creates crusting and bare, often hydrophobic surfaces. These hard, impermeable surfaces channel water into low-lying areas and waterlog the ground. Lime leaches from aging concrete sidewalks and building foundations, which raises the soil pH. Temperatures become abnormally elevated due to the absorption of solar energy by the built landscape and hard surfaces (called the ‘heat island’ effect). All of these human activities, whether recent activity or contamination that happens gradually over time, disturb the soil profile. Poor soil structure is a significant stress factor for plants. It affects water infiltration and permeability, water-holding capacity, aeration, and loss or pore space. If plants cannot access sufficient water and oxygen, they decline. Architectural visions of lush, overflowing vegetation are now a common sight on construction sites in urban areas. While the developer’s dream looks great on the surface, soil levels are often drastically changed within the site. Without sufficient planning and soil management (taking into account different species and site conditions), plants in development sites will grow poorly and become predisposed to other environmental and biological stresses. ‘Fill’ in development sites entails both soil stripping (to lower the soil level) and adding fill (to raise the soil level). Soil stripping can sever roots and remove the nutrient-rich soil layers, which interrupts the all-important nutrient cycling and soil organism activity. When a significant amount of fill is added to a landscape, soil conditions will change, as will the root growth potential of existing trees. Although it is difficult to predict the effects of putting fill over the root zone of a tree, it is generally not recommended. Estimates show that 80-90% of all tree problems are related to soil and its effects on root growth potential and health of the trees’ entire root systems. • Trees that have recently suffered other injuries may be more susceptible to damage from fill. • The fill soil should be similar in texture to the base soil. • Avoid base soil compaction during installation. • Tree wells can reduce damage potential to the trunk of a tree, so the larger the tree well, the better it is for the tree. You must also allow for drainage at the base of the well. While the effects of drastically altered urban soils sounds dire, there is much we can do at ground level to improve our soils – even before planting. From councils and land planners to local gardeners, how can we rebuild our soils? Injecting nutrient-rich liquid humus into the soil will build up the organic content of your soils again. This aids water-holding capacity and reduces leaching, buffer effects of any pesticides and stabilise pH. Nitrogen is the most commonly depleted nutrient in poor soils, so injecting liquid nitrogen will also help build up your plant growth. Mulching is one of the most beneficial things a homeowner can do for the health of a tree. Mulch can reduce water loss from the soil, minimise weeds, and improve soil structure. It also provides the organic matter that encourages soil organisms that play such a vital role in the nitrogen cycle. Applying a 50-100mm layer of organic mulch can mimic the natural environment and improve plant health. Understanding that the roots of most trees can extend out a significant distance from the canopy drip line, a thin layer of mulch applied as broadly as practical is best practice. Different types of organic mulches include wood chips, hardwood and softwood bark, leaves, compost mixes, and other plant-based products. Depending on the material and climate, some organic mulches may decompose faster, and therefore must be replenished more often (considered best practice by arborists and landscape managers). ‘Soil Profile Rebuilding’ improves the physical and biological characteristics of soil to allow for revegetation. This restoration technique is most suited to sites where topsoil has been completely or partially removed and subsoil layers have been compacted (graded or trafficked by equipment). The technique includes first a sub-soiling procedure, adding organic matter in the form of compost or replacing/adding topsoil, then planting with woody plants. 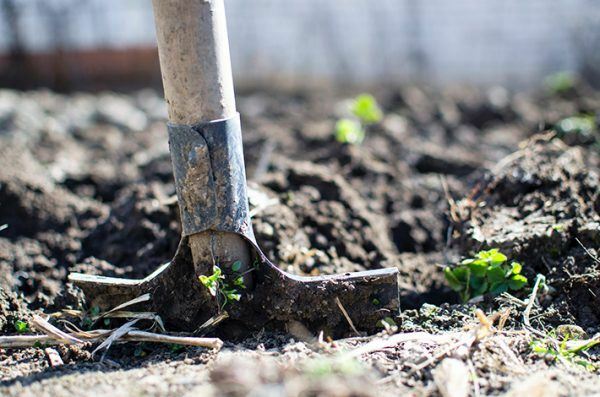 Soil preparation helps restore soils with characteristics similar to undisturbed soils, however, the complete restoration process requires root activity and occurs over many years. Where rapid results are required (such as where soil has been contaminated by a fuel spillage), poor quality soil can be removed and replaced. One form of soil replacement is ‘radial trenching’: soil is removed from trenches extending radially from the trunk and replaced with soil with improved properties. This soil is removed to a depth of up to 0.6 m and replaced with a mix of sand, composted organic matter and fertiliser. If we want to receive the greatest benefits from flourishing vegetation in our urban landscapes, we need to first consider the soil in which we ask plants to grow – then take action in our own patch. Without tending to what lies beneath our feet, our soil cannot sustain biological life. The greater amount and diversity of biological life there is in the soil, the greater potential for healthier plant growth. Soil health is the basis for plant health and by extension, our healthy plants can help develop healthy humans. Download the PDF of ‘At ground Level’ here. Looking for more info on creating healthy soil? The Australian Standard for Composts, Soil Conditioners and Mulches provides guidance on the characteristics and application of mulches. For a discussion on the implications to tree health when altering soil levels, see ‘Changes in Soil Level’, Australian Arbor Age, July 2014. For more on urban soil rehabilitation, see ‘Below Ground Matters’, Urban Forestry & Urban Greening, January 2016. Soil Profile Rebuilding Specification by Susan Day et al. is licensed under a Creative Commons Attribution-Non-commercial 3.0 United States License. It may be used freely as is or modified. However, use of the term “Soil Profile Rebuilding” should only be used when soil restoration is performed as described in this specification. See www.urbanforestry.frec.vt.edu/SRES/specification.html for full details. Watson, G.W., Kelsey, P. & Woodtli, K. 1996. Replacing soil in the root zone of mature trees for better growth. Journal of Arboriculture, 22. Coder, Kim D. 1996. Construction Damage Assessments: Trees and Sites. University of Georgia. Costello, L.R. and Susan D. Day. 2004. A New Look at the Impact and Management of Fill Soil around Trees, pp. 25-29. Arborist News. August 2004. Craul, P.J. 1999. 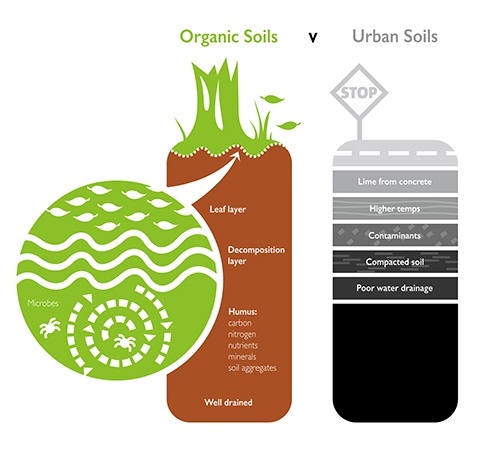 Urban Soils: Applications and Practices. John Wiley and Sons, New York. Cue, K.P., S. Josiah. 2002. Landscaping around established trees. Retrieved June 15, 2005 from NebGuide Website: http://ianrpubs.unl.edu/forestry/g1452.htm. Day, S. 1999. Growth and Physiology of Several Urban Tree Species in Soils Disturbed by Construction Fill or Compaction. Dissertation submitted to the faculty of Virginia Polytechnic Institute and State University. Harris, R.W., Clark, J.R. & Matheny, N.P. 2004. Arboriculture: Integrated Management of Landscape Trees, Shrubs and Vines. Fourth edition. Prentice Hall. Johnson, Gary R., 1999. Protecting Trees from Construction Damage: A Homeowner’s Guide. University of Minnesota Extension Service, FO-6135. Koetter, R. & Johnson, G. R. (n.d.) Will fill kill? The truth about adding soil over the roots of existing landscape trees. [Online]. University of Minnesota Forest Resources Extension. Available at: http://www.myminnesotawoods.umn.edu/2008/12/will-fill-kill/. [Accessed 2 June 2014]. MacDonald, J.D.,Costello, L.R., Lichter, J.M., and Quickert, D. 2004. Fill soil effects on soil aeration and tree growth. Journal of Arboriculture 30(1). Smiley, E.T., T.R. Martin and Bruce R. Fraedrich. 1998. Tree root failures. Landscape Below Ground II: Proceedings of an International Workshop on Tree Root Development in Urban Soils. D. Neely and G. Watson, Eds. International Society of Arboriculture, Champaign, IL. Tusler, P.E., J.D. MacDonald and L.R. Costello. 1998. Fill soil effects on soil aeration. Landscape Below Ground II: Proceedings of an International Workshop on Tree Root Development in Urban Soils. D. Neely and G. Watson, Eds. International Society of Arboriculture, Champaign, IL. University of Rhode Island, (n.d.). Maple Tree Decline. Retrieved June 16, 2005, from Greenshare Factsheets Web site: www.uri.edu/ce/factsheets/sheets/mapletreedecline.html. VanDerZanden, A.M. and J. McNeilan. 2001. Conserving Water in the Garden: Landscape and Lawn Care. Retrieved June 16, 2005 from Orgeon State University Extension Service Website: http://eesc.orst.edu/agcomwebfile/EdMat/html/EC/EC1531/EC1531.html. Watson, G.W. 1998. Tree growth after trenching and compensatory crown pruning. Journal of Arboriculture, 24. Yelenosky, G. 1963. “Soil aeration and tree growth.” International Shade Tree Conference Proceedings. 40:127-147.